Anybody know what this is? You guessed it if you guessed the center of a merry-go-round. I have no idea how old this merry-go-round is exactly, but I do know that it is the same one that was on the playground when I started school in 1957. Of course, it was just a plain rusty metal color with plain wooden/board seats. There was no red, blue, yellow, green or red to it. 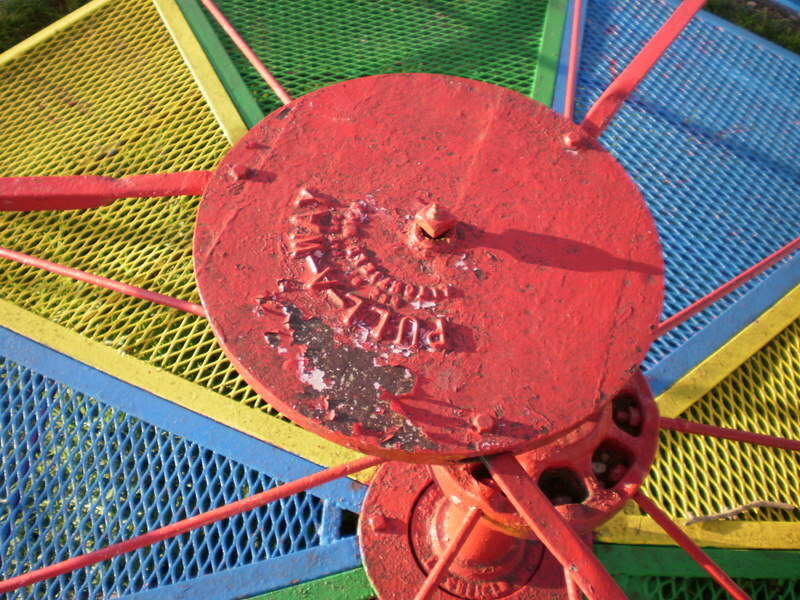 This nice paint job makes the old merry-go-round look almost new. This particular merry-go-round was for the “big” kids. You had to pump those metal handle bars to make it go faster. You did not have to run around and around to get it going and jump on. The more you pumped, the faster it went, but if you fell off, it was farther to the ground than the “little kids’ ” merry-go-round. The merry-go-round shown below is on the same playground, and it, too, has been there since 1957, at least. It was for the “little kids”. As the gravel and dirt show today, kids had to run around to get it going and then hop up on the benches, but it wasn’t far to the ground if you fell! Both of these playground attractions bring back fond memories. 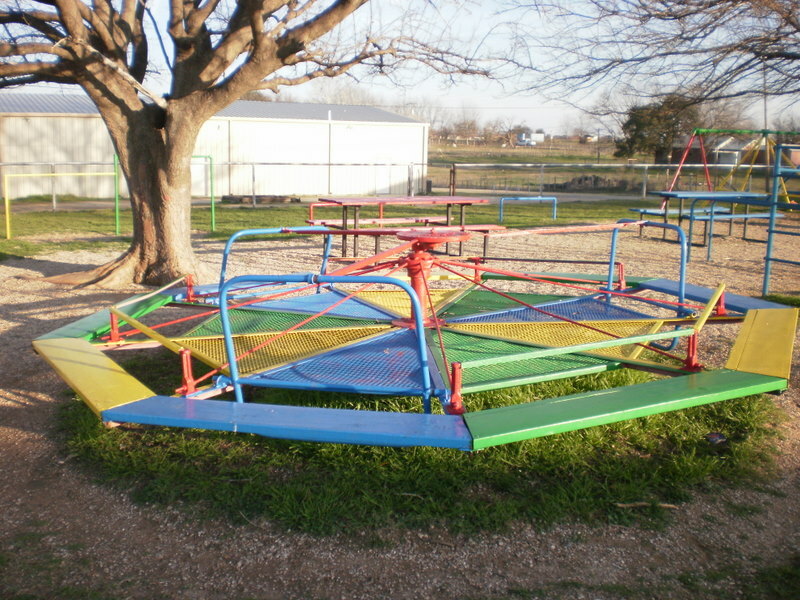 The merry-go-rounds were probably purchased by the PTA of which my mother was president at one time. The PTA raised funds for their projects through the Halloween Carnival and Coronation of the King and Queen. Both events were looked forward to by the whole community. Hooray to those who didn’t throw out the old merry-go-rounds! 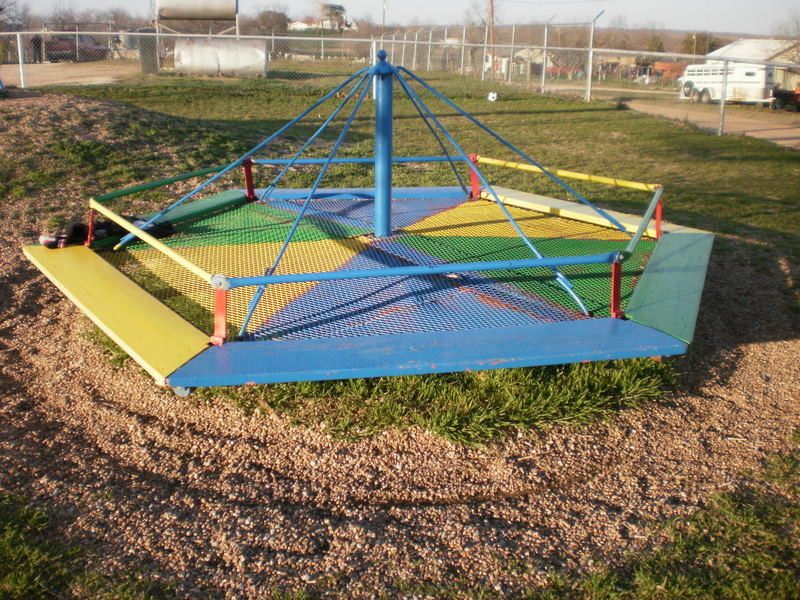 I am equally as proud that we still have our merry-go-rounds. Three generations of our family have played on that equipment! That’s part of the uniqueness of our fabulous little school. It tooks me several minutes to find a photo of this favorite merry go round that I played on at the Cavanugh Lake Park in Chelsea Michigan. I’m glad to have found this photo. Thanks! Isn’t that memory of feeling the ride on the old merry-go-rounds a great one? I love remembering that feeling! Thanks for commenting!